Loft Store: Let officers know what new products you would like to see!! Stage to Screen Movie Night: Noises Off is what we will be watching! It is a straight play (comedy). Friday, April 13th in the Loft! Chicago: Auditions are June 4,6,7. Rehearsals are July 16-August 15. Performances are August 16-25 in the black box. No fee for auditioning, but $99 fee for being cast. Ages 16-22 only. Bring a 32 bar cut of a song (style of show) and accompanist is provided, there will be a dance call, so wear comfortable clothes, and bring a resume and current headshot. Auditions are at Merrill Community Arts Center. It is directed by Kajsa Jones! Show Field Trips: West Side Story in summer of 2018, and Dear Evan Hansen spring of 2019! Hopefully some plays too!!! Hestwood Visit: Ashland is putting on Hairspray during the summer, and there are LOTS of camps to be counselors for as well! Check out the Ashland website for these wonderful opportunities!! Winter One Act Results: Sadly East Ridge did not advance, but Park High School did! Great job to Park!! Scapino: Performance days are May 4,5,6. Marcie Berglund is the spring play director! (mberglund@theloftstage.org) There are scripts available to checkout and read prior to auditions. Audition date TBA! Possibly April 7th should be lots of fun! Bring money in! ($65 total for bus, dinner, show, and tour) Checks are to Loft Stage Boosters!!!!!! Choir people invited! We will leave right after school. Tour first, then dinner, then show. You must participate in all 3 shows, have 10 Thespian points for East Ridge related activities, and have 10 technical hours (inclusive of individual show requirements) All of this will be tracked through Google form submissions, so please remain current! Do not forget to log Thespian points! We have our ceremony at the Banquet in May, and you can get inducted and or awarded for points! NIES is an option at the conference. You can perform one or two of the following: solo, duet, trio, group song, monologue, partner scene, group scene, etc. Do not worry about payment yet. *One Act Festival is at East Ridge on Friday (January 19th at 7PM)!! The cost is $5 for general admission. 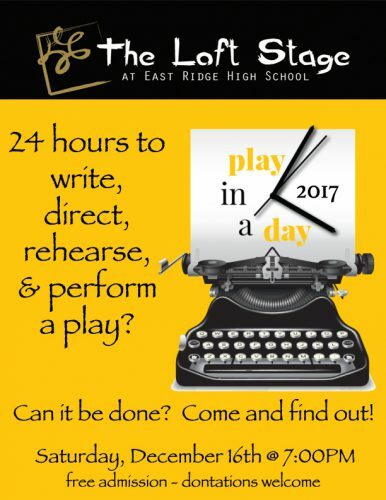 All three highschools in the district will present their one acts! We are in need of parent volunteers for ushering and ticket sales (talk to Mrs. Carlson) and students for ushering. POSTER PLASTER IS TOMORROW!! Our community outreach project is Grace After Fire. Photos of family/loved ones in the military, military uniforms, backpacks, boots, helmets, or other equipment, old war related newspapers, or anything military related! Thanks!! ^All of these are great ways to practice acting or get to learn about theatre in general! International Film Studies is an option as well! *Reader’s Theater Opportunity!! This will be held Friday, February 2nd in the Loft from 5pm-10pm. It combines wrestling and theatre. There will be performance excerpts from various scenes and monologues relating to wrestling. See Mrs. Carlson if you’re interested in performing! Little Shop of Horrors: December 15th in the Loft Stage 7pm-10pm, Snacks will be provided. Kicks off play-in-a-day. Wear your jammies! Backstage Day (techie tour): Date to be determined, but will be before One Act goes to competition. Learn how to hang lights, coil cables, run sound / light boards and more! Loftie Holiday Party: It will be December 30th 8-11pm at Merrill Arts Community Center. White Elephant gift exchange. Thespian Conference: It will be Presidents Day weekend, Sunday February 18th and Monday, February 19th all day. National Individual Event Showcase will take place as well as workshops. Cost is $80 per person until Saturday, December 16th. One Act Festival: January 19th at 7pm. Cast and crew register on feepay. Parent meeting is Wednesday, December 13th More details to come. Coat Drive Results: We collected 99 coats, almost 20 snowpants, a couple of pair of boots and a few bags of hats and mittens. 2017-2018 Spotlight Education Honors for East Ridge High School’s production of Joseph and the Amazing Technicolor Dreamcoat are posted on the Loft Stage website! Loftie Gear : We have Loft merchandise featuring our lovely model, Jimmy, great Christmas/Hannukah/B-Day gifts jackets, beanies, fuzzy blankets and cleaning cloths…if you have merch you’d like to see, talk to one of the officers! New York Trip : Date Change, The New York Trip will be over MEA October 18-22, 2018, parent meeting December/January, Fundraising ideas? ?